When Hebes turn up in my local bargain bin I am always tempted. I'll often buy them all, and then find spaces in the garden. 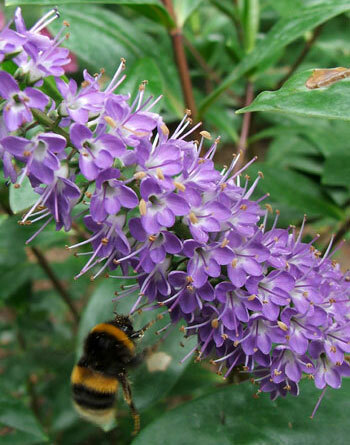 Hebes trim easily, make great little hedges or single shrubs, and look beautiful when in flower. And the bees in my garden love them! They may be easy-care shrubs, but still need water and sunshine to perform well. But by far the best thing about Hebes is their attraction for the bees. 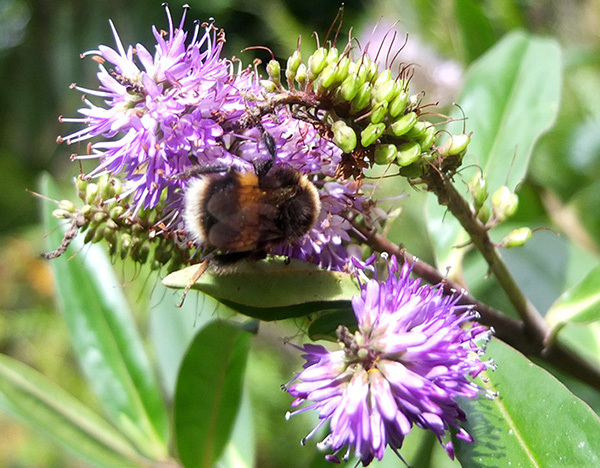 Whenever a Hebe is in flower in my garden there'll be some honey bees and bumble bees buzzing around it. a he bee on a hebe? 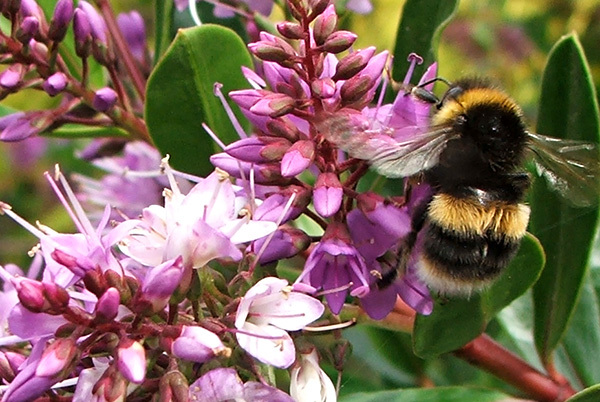 The Hebe in this photograph is a Jack Hobbs hybrid. He is a New Zealand breeder, and has a series with names like 'Wiri Mist', 'Wiri Charm', and so on. They've been readily available in local nurseries for some time now. Naturally I rescue any that find their way onto the sale tables at the local nurseries. Hebes when smaller make great foliage shrubs, and are perfect for filling gaps. But to look their very best they need to be grown in fairly full sun. It's a great pity for the bees when they flower very poorly, if at all. Some of my Hebes will have scatterings of flowers at random times during the year, depending on whether or not I've pruned them. The best idea is to trim them as soon as they've flowered. Even a light overall haircut with the gardening shears is recommended, and this will keep them bushy. These are both good theories, and some that every good Hebe gardener should adhere to.